Sand and Space – Live MoHo! 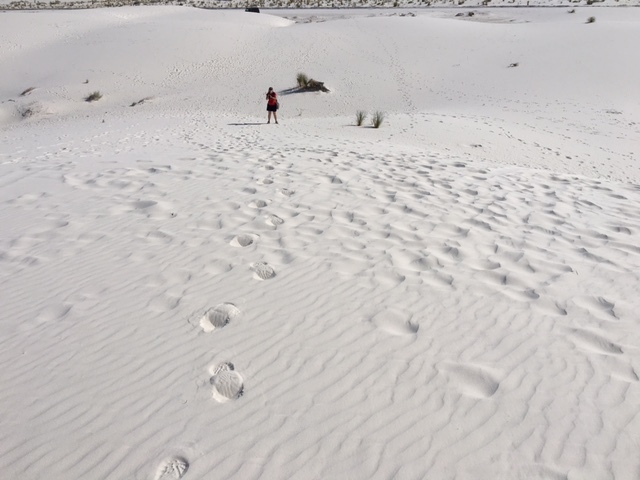 We got up early so we could drive to White Sands Monument, about 35 minutes from our RV park. We wanted to get there before temperatures rose too much and we wanted to leave time for the Space History museum later in the day. 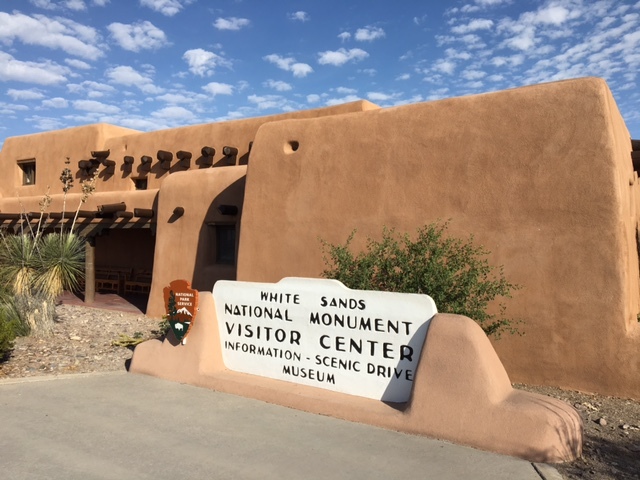 The visitor center is very “authentic” being a pueblo-style adobe building built in the 1930s It is in pristine condition. But the big draw is the attached gift shop where they sell plastic sledding disks! Being the only game in town for sleds – not a big market in the desert in summer – we had to stop. Sleds are $17 or $10 for a used sled (they often don’t have any used sleds). They offer to buy back the sled, if unbroken, for $3 IF you keep the receipt. 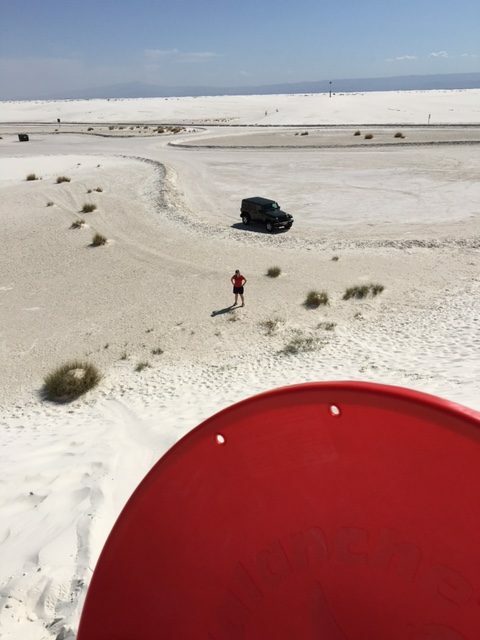 They are serious about that part – apparently people go to the sled store next door, but a sled for $2, and then sell it for $3 at the White Sands Gift Shop (yeah, right). Talk about profits! The gift shop also sells a little cube of wax for $2 that they claim helps the sled slide down. We were pretty skeptical of that, but we bought the wax anyway. I mean, when will we ever be back? We drove into the park and quickly became engulfed in the dunes. 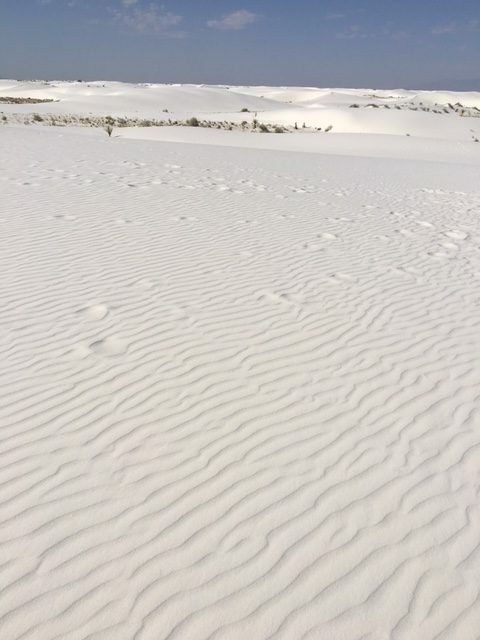 White Sands is the worlds largest gypsum dune field. There is literally no place on Earth like it. It is also adjacent to Holloman Air Force base and the White Sands proving grounds. 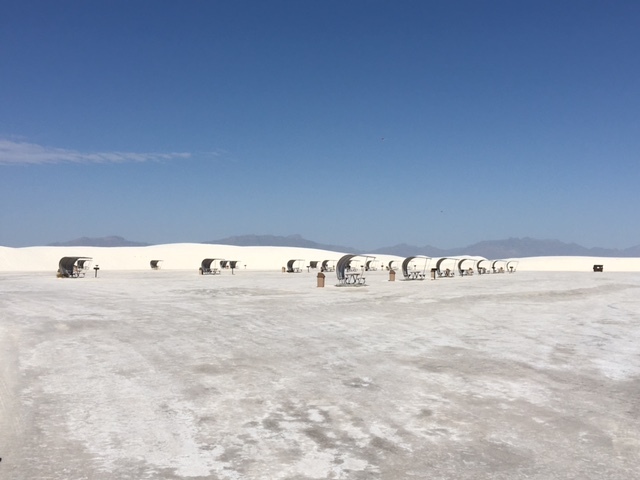 At least twice a week, the highways around White Sands are closed for a few hours so the Air Force can test weapons. Fortunately no weapons testing was going on today and we had no delays. 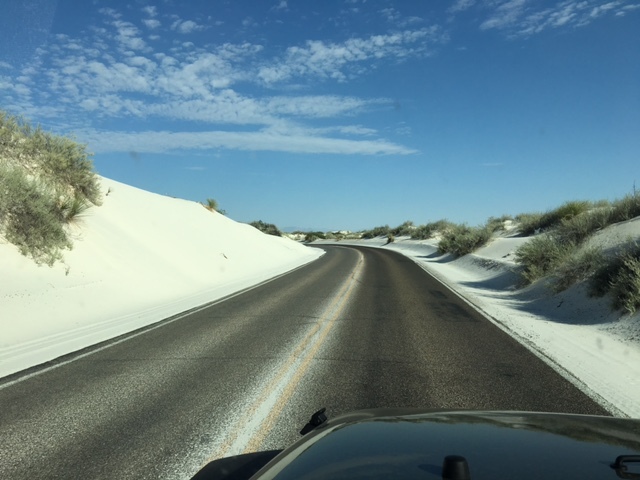 As we drove deeper into the park, the paved road ended and the road was literally plowed out of the gypsum dunes like a snowfield! The Park Service has plowed huge lots and setup little picnic tables with a metal sunshade. I’m not sure I would want to picnic here, but its a neat idea. There was nobody here at 8:30am on a Sunday Morning – we had the place to ourselves. The sand is blinding, pure white. It is spectacular to see an endless expanse of white stretching in every direction. 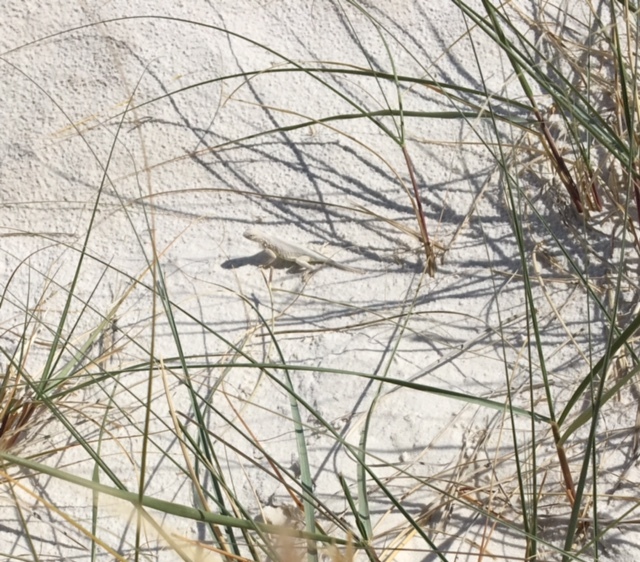 Compared to other sandy areas we have explored, the sand at White Sand is more fine grained and a uniform color. Wind stacks up the sand into huge shifting dunes. We hopped out of the car with our sled and our wax in search of one of those dunes we could sled down. We found a dune that looked promising and I hiked up to check it out. I blazed the trail and then gave the sled to Heather! Feel the rhythm, feel the ride, step on up, its bobsled time! We spent the next 30 minutes or so sledding the hills, on sand that looked (and felt) a lot like snow! And that wax they charged us $2 for? Well, it turns out that it works really well. I was surprised at how much of a difference it made! 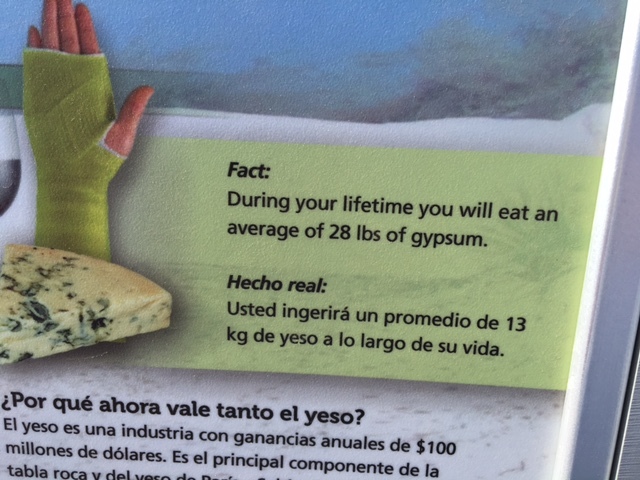 One of the handy info tidbits that they share at the park is a sign showing the average person will eat 28lbs of gypsum during their life. Thanks to a few mouthfuls of gypsum sand when the sled tipped, I am well-positioned to beat the average!! White gypsum sand doesn’t taste any better than regular sand, if you are curious. The park has several animals unique to the area, including a lizard colored almost pure white. We actually saw one hiding in the grass by our Jeep! 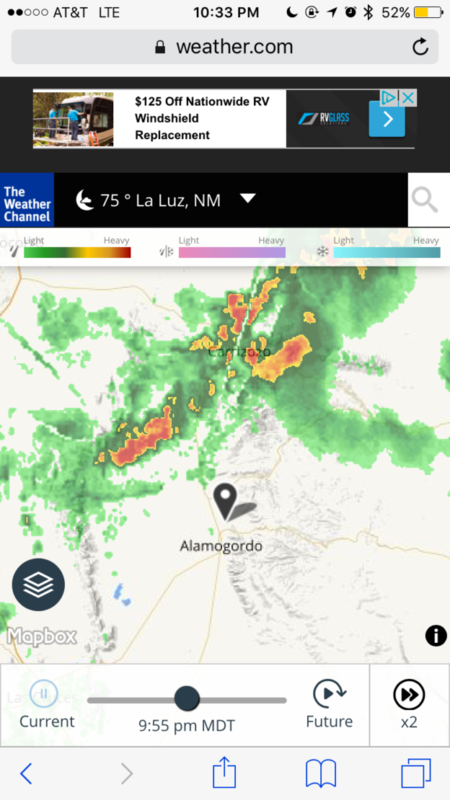 Energy falling and temperatures rising, we decided to head back to Alamogordo so we could see the Space History museum. 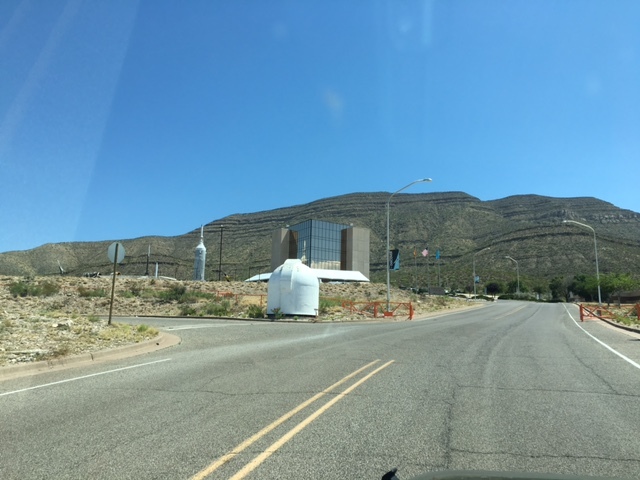 The Space History museum is probably the most famous and popular destination in Alamogordo, but nobody told Garmin that. Not only did it not know about the Museum, it didn’t even know about the address or street it was on! 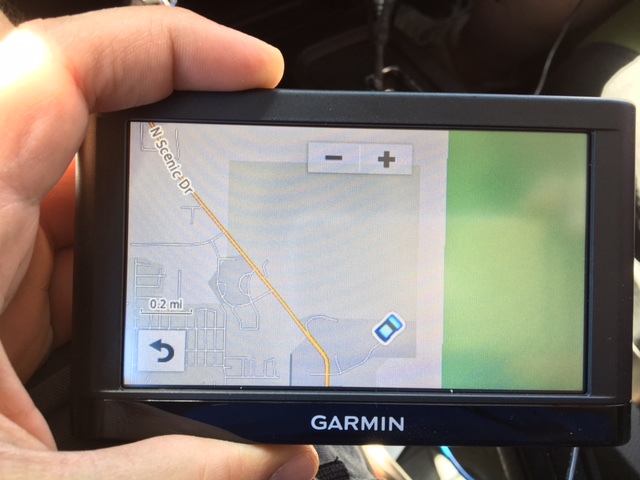 We used our iPhones to navigate there, and when we arrived I turned on the Garmin to see what it showed in that spot. See that square with our car parked in the lower left? Yeah, that “empty spot” is the museum. Update the database guys! 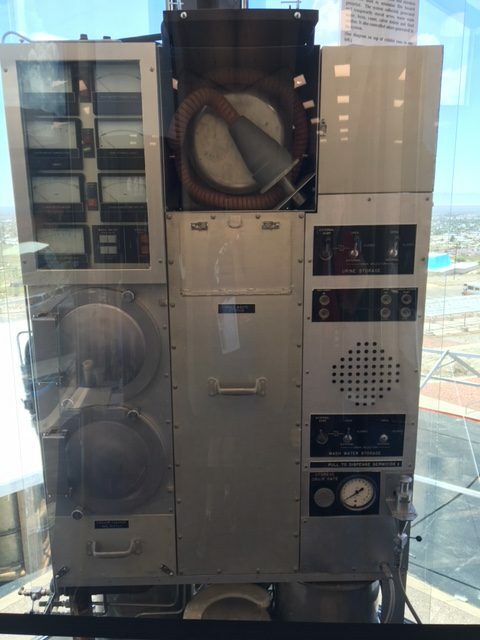 Meanwhile, if you go to Alamogordo, don’t expect your Garmin GPS to get you to the Space History Museum. 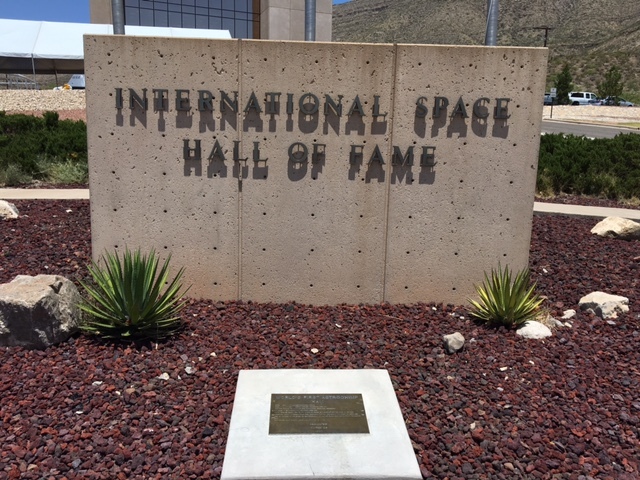 Most people associate Houston or Cape Canaveral with the space program, and while those are rightfully both important, Alamogordo plays a major role as well. 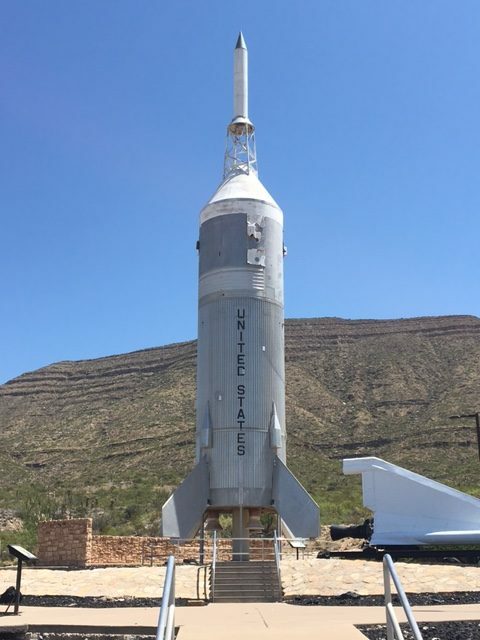 The US space program actually began in Alamogordo with testing of missiles including captured German V2 rockets from WWII. 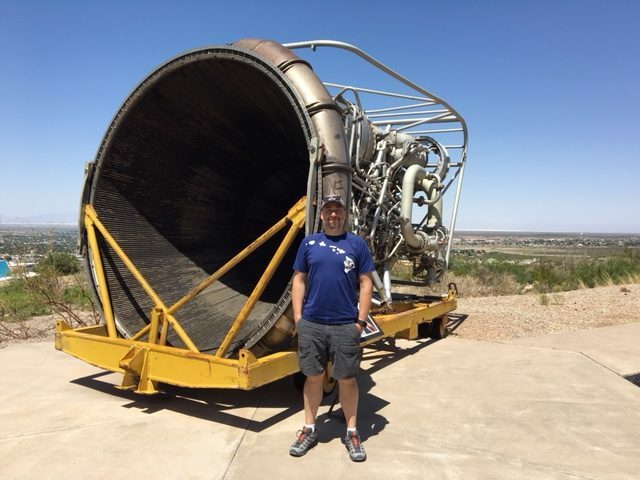 There is an actual V2 rocket tail on display. Sadly it is just sitting outside rusting. Kind of a sad fate for such a piece of history! Other exhibits outside are in better shape. We saw a number of rocket engines including this F1 engine used on a Saturn V rocket. The same Saturn V rocket that took men to the moon! The F1 was developed by RocketDyne Corp in the 1950s and is the most powerful liquid-fueled single chamber rocket engine ever made! Five of these F1 engines were used on each Saturn V and generated a staggering 1.5 million pounds of thrust!! Wow!! 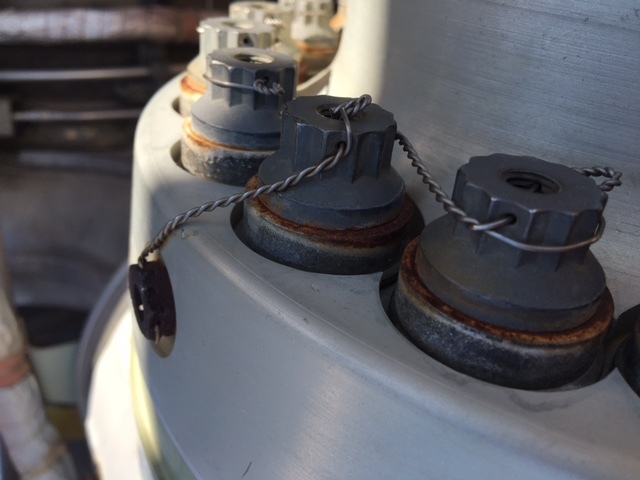 The rocket engine is easily visible, and we could see every single nut and bolt was safety tied. A reminder that this IS rocket science and the stakes are so high any failure could be catastrophic. The museum has a number of really interesting artifacts from the space program on display. 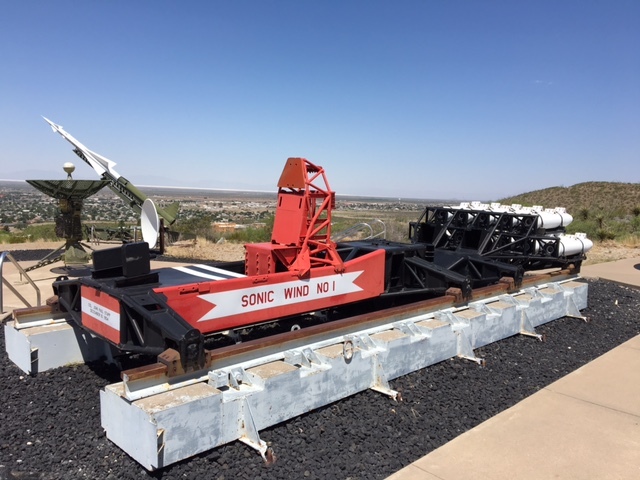 One included the sonic wind, a rocket-powered test sled that was used to determine the effects of fighter pilots ejecting at high speeds. Volunteers would strap into that chair and then get blasted to massive speeds by those rockets at the back. Not to tell you what to do, but that’s one job probably best left to others. Little Joe sits outside, another relic from the Apollo program. This was the test unit to determine if the Apollo astronauts could safely abort in case of an emergency. 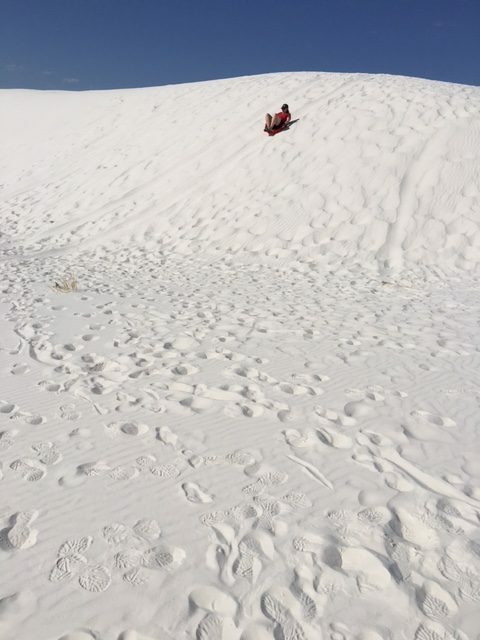 Little Joe was tested very successfully many times at White Sands. The museum is full of very interesting displays. This space toilet is a popular display. That thing is all business for those times when you need to, uh, do business. We saw this label on the rocket engine from the Lunar Lander. That’s right, Aerojet of Sacramento made those engines. 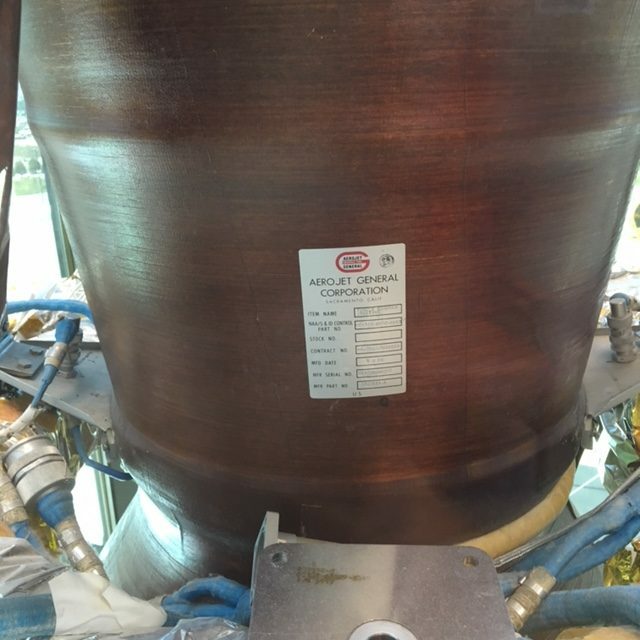 As someone who drove by Aerojet 2x a day for nearly 10 years, it was nice to see one of their products had played such an important role in the space program. As we left the museum, we walked past the grave marker of the first American in space. Most people think of Alan Sheppard or John Glenn. Both are American hero’s, no doubt. But neither was the first. That honor goes to HAM, the first chimp in space! 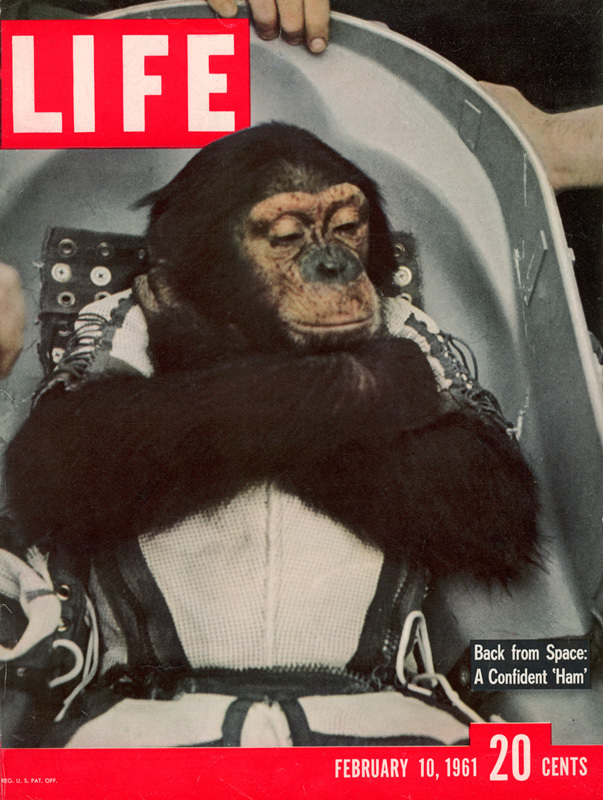 LIFE cover 02-10-1961 Chimpanzee named Ham in space capsule after returning from the Mercury Redstone 2 space flight, from AP. HAM was named from Holloman Aerospace Medical center where he was trained. His name was due to the fear of bad publicity if a named animal died during the test, so HAM After his space career, Ham spent 17 years at the Washington DC National Zoo before passing away. 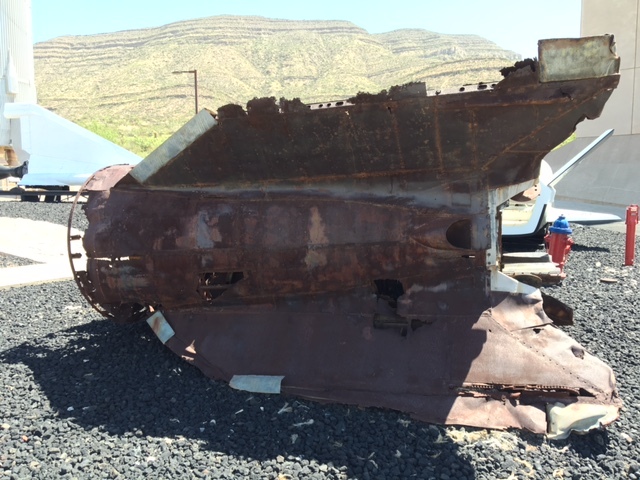 His remains were returned to Alamogordo and buried by the flagpoles at the Space History museum. The museum was awesome! We had some time so we decided to explore the McGinn’s pistachio tasting room conveniently located directly across from our RV park. 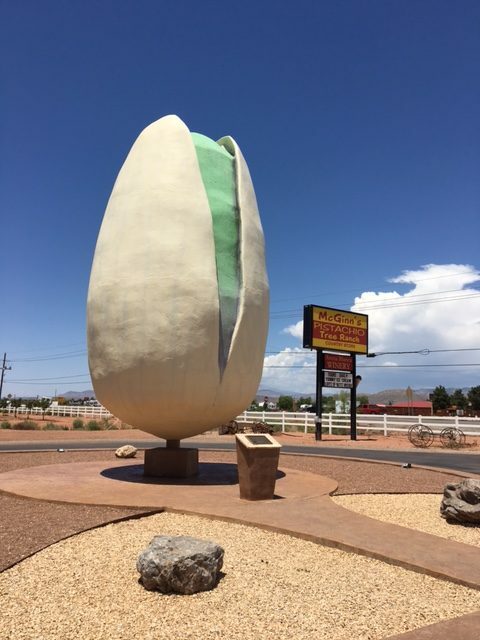 McGinn’s is hard to miss – the giant pistachio out front is at least 25 feet tall!! And in case you are wondering, yes, they grow pistachios here. 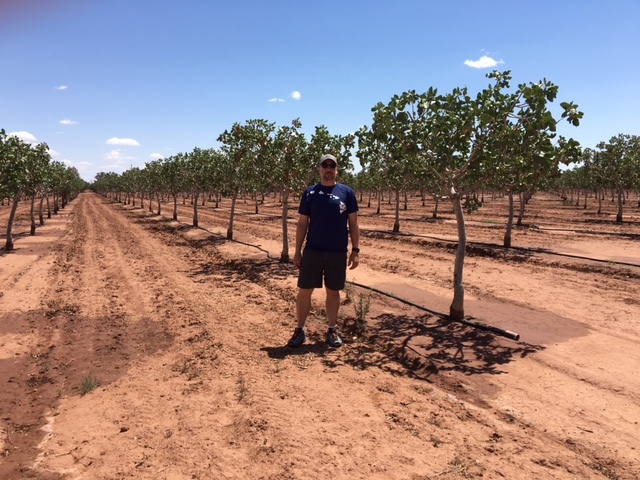 I had never actually seen a pistachio tree so we walked out to the orchard and looked at the trees. 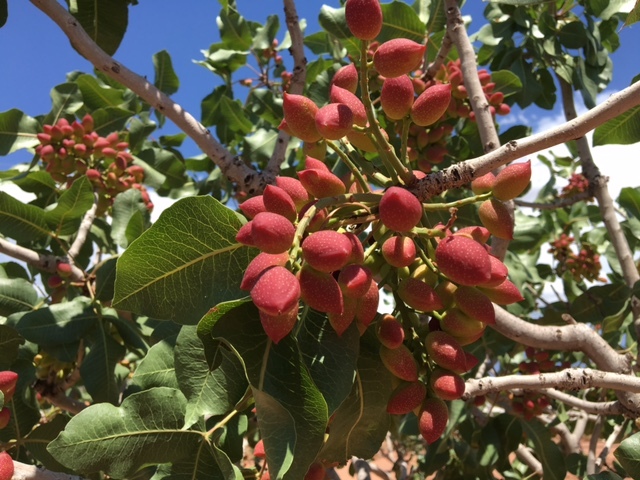 The pistachios apparently grow in clusters and are a bright red color. Maybe that’s whey they used to dye pistachios red? McGinn’s had at least 20 flavors of pistachios from garlic to lemon to barbeque to cocoa to chile. We tried most of them. They also had a free wine tasting. 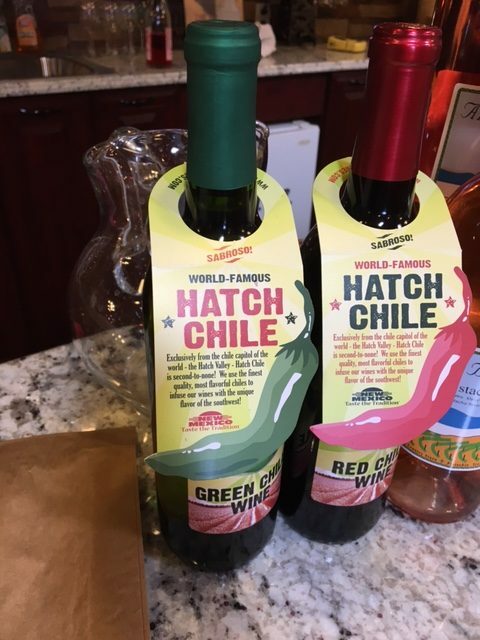 We tried 8 different wines, including – wait for it – Hatch Chile wine. I tried it as a joke, but the red chile wine was actually quite good. We bought 2 bottles. I can see it being perfect with fajitas! Stuffed full of pistachios and worn out from sledding and walking around the museum, we headed back to the MoHo for a nice dinner and one of the tasty New Mexican merlots we bought. We were awoken at about 10:30 when savage wind gusts slammed into our MoHo. I got up and ran to put the satellite dish down. I looked out the window and blowing dirt was so thick it seemed like fog. Heather looked at the weather and we saw a severe thunderstorm warning with gusts over 60mph forecast in 30 minutes. We fired up the diesel and brought in the slides. Wind won’t really hurt the slides themselves, but it will savage the slide toppers. We waited and watched the lightning flash and the storm get closer on radar. Rain started and we assumed it was going to get bad. Just as the main part of the storm hit, it sort of fizzled out. Oh, don’t get me wrong. It rained pretty hard, but the wind had died down and the rain wasn’t torrential. Around midnight, the storm had passed and we finally fell asleep.